Charges have been filed against a suspect wanted in two fatal shootings – the first incident on June 13, 2016 in Missouri City and the second at 265 El Dorado Blvd. in Clear Lake about 10:05 p.m. on July 9, 2017. The suspect, Douglas Alexander Herrera-Hernandez, 20, aka Alexander Hernandez, aka “Terror,” is charged with capital murder in the 240 th State District Court in Fort Bend County and murder in the 262 nd State District Court in Harris County. Houston Police Department Homicide Division Sgt. C. Sturdivant and Officer W. Gilbert said that on July 9, HPD officers responded to a shooting that occurred at 265 El Dorado. Witnesses reported hearing people arguing, followed by multiple gunshots. Responding officers found the victim, Kevin Alvarez, 26, had suffered multiple gunshot wounds. He was transported to an area hospital where he was pronounced dead. Further investigation led to the identity of Herrera-Hernandez as the shooter in Mr. Alvarez’s death. He was subsequently charged in this case and currently remains at large. Herrera-Hernandez is believed to be traveling with this girlfriend, Josselin Leyhmar Romero Flores, and their infant child. On June 13, 2016, Herrera-Hernandez participated in the murder of a male, 16, who had witnessed several gang-related murders, police said. This incident occurred at Buffalo Run Park in Missouri City and was jointly investigated by the Missouri City and Houston Police Departments. Herrera-Hernandez was subsequently identified as a suspect in this case, charged, and a warrant issued for his arrest. 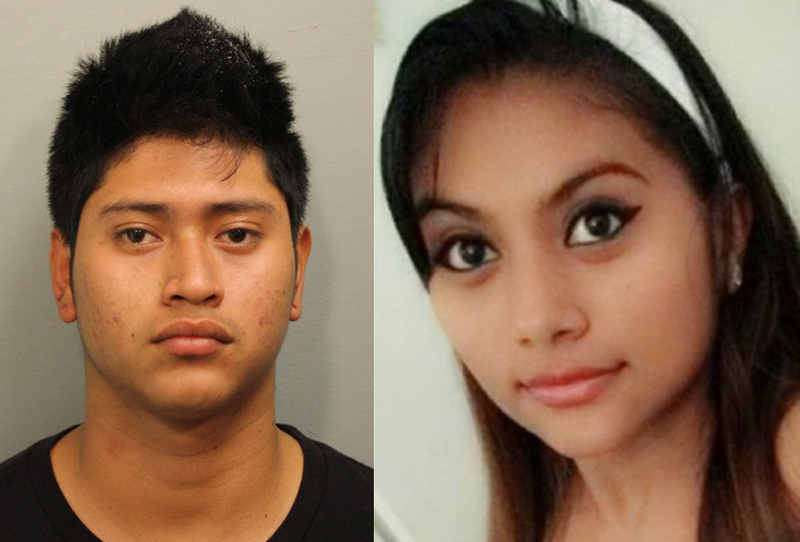 Anyone with information on the locations of either suspect Herrera-Hernandez or Flores is urged to contact the HPD Homicide Division at 713-308- 3600 or Crime Stoppers at 713-222-TIPS.